For the last couple of months, Benz has been asking for a “cow having a calf” cake for his birthday. We tried our best to persuade him to pick something else. In fact, I overheard Tyler say to Benz, “A Thomas the Train cake would be cool. Would you like Mom to make one for your birthday?” He replied, “I don't even watch Thomas the train”. I am Jamie, a wife, a ‘boy' mom, a nurse, a lover of all carbs, an apron collector and an avid thrift store shopper. Both my sons have a love for farming and ranching and a respect for the way of life. Benz, four years old, plans to one day be a “vet doctor” and a cattle rancher. This love for farming and ranching is quite apparent, when you walk into our home, you are usually greeted by a fleet of John Deere tractors, cattle liners and cow – calf paired toys. And don't even get me started on the basement. 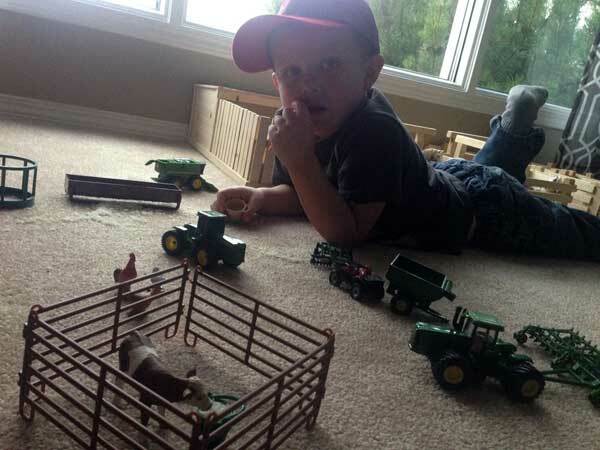 The basement has been totally taken over by a growing farm/ranch operation where they spend hours playing. 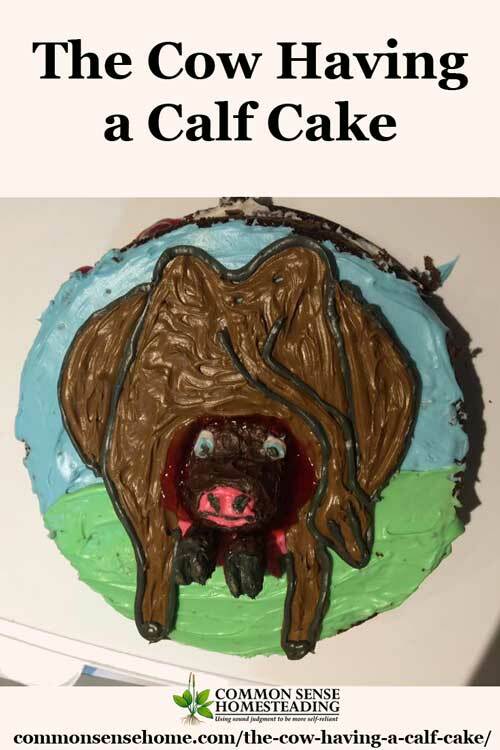 Needless to say, it really wasn't a surprise when my three year old (at the time) asked me to make him a ‘cow having a calf' cake for his upcoming birthday, but the results did turn out to be humorous. As a mom of two boys, I've had to learn to love what they love. Their passions have become my passions. When most kids are reading bedtime stories, I'm looking at hunting magazines. Some days the boys head off to school and leave me in charge of their cattle operation, looking after sick toy calves. Whatever they choose to do in this world, I vow to be their biggest fan. Even if it means making a silly cake. If it matters to them, it matters to me. 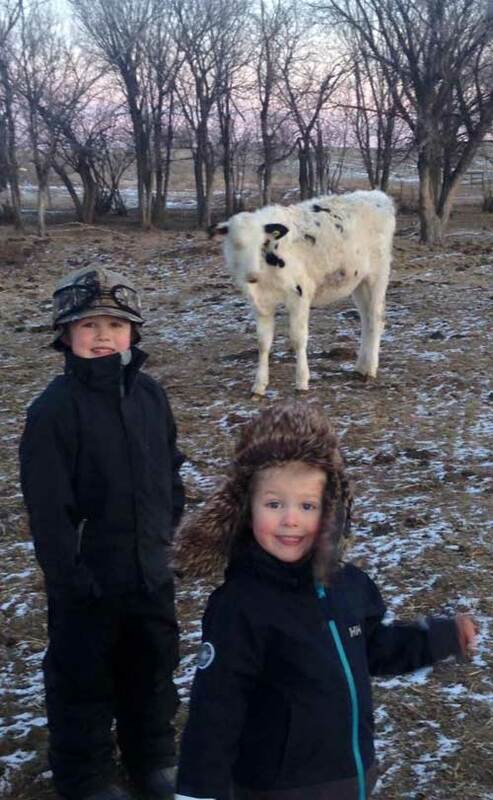 I don’t know if you would call this a homesteading story but it was a fun experience we had with two of our boys when the were 5 and 6 years old. Our back yard was full of trees and my husband decided we needed a nice back yard to do things in. We had chickens and moved them out of the area they were in and used that space to put in a nice garden area because of all the lovely compost that had been left by the chickens. While the rest of the family were helping put in grass. Joe and Tim explored the garage and found a old shoe box of veg seed. They asked if they could plant them in garden. Well they were pretty old and the garden area wasn’t even cleaned or raked yet but theboys were go excited we told them to go ahead and plant them. So they, with great excitement planted all of them. We had them water their garden and sort of forgot their garden. Well not realizing it we watered the new lawn each day and the water was also going into the boys garden. After a month of this something began to come up. We weren’t sure what it was but the boys were thrilled. They went next door to our neighbors who were super gardeners. They yard looked like the Garden of Eden. To ask them to come tell them what they were growing. The husband came and looked and said it looked like zucchini or pumpkin. Well you know what they wanted, pumpkins. Well they got there wish because 35 of the most beautiful pumpkins came up. Since the boys had grown them we told them they could do what they wanted with them. Their older sister was working in a nursery school after school and told her teacher about the pumpkins and teacher bought 12 of them. The boys now were rich. They gave one to there older brothers friend to give to his little brother who couldn’t walk. Shared some with their best friends. gave several to mom to can for pies. Each of the family got one for carving for Halloween .We roasted seeds. I can’t remember what else they did but now they are in there 30’s and still remember there first garden. Sometimes it is a little miracles that happen in life that we always remember. That’s a wonderful story! I bet the boys were so proud.